result to show that 0 x2 dx exists. 2. Determine whether each integral is convergent or not. Evaluate those that are convergent. (a) 0 e2xe +3 dx. 3. 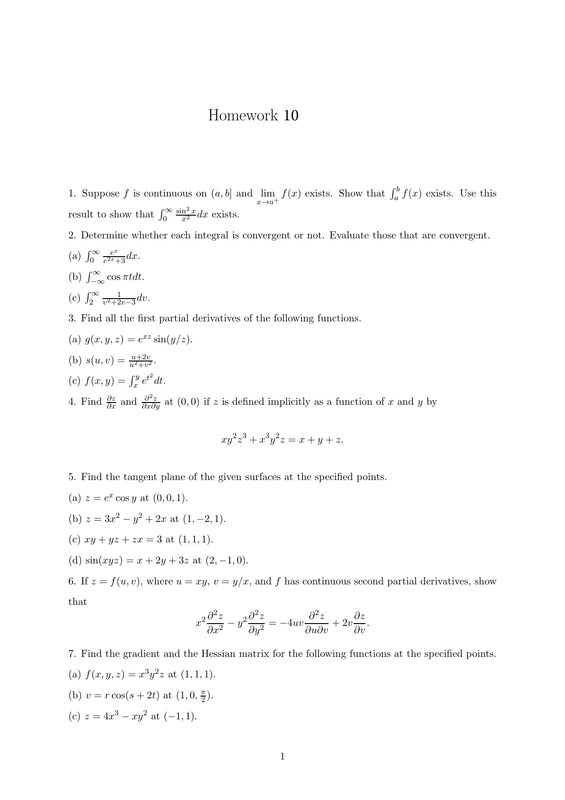 Find all the first partial derivatives of the following functions. (a) g(x, y, z) = exz sin(y/z). xy 2 z 3 + x3 y 2 z = x + y + z. 5. Find the tangent plane of the given surfaces at the specified points. (a) z = ex cos y at (0, 0, 1). (b) z = 3x2 − y 2 + 2x at (1, −2, 1). (c) xy + yz + zx = 3 at (1, 1, 1). (d) sin(xyz) = x + 2y + 3z at (2, −1, 0). 7. Find the gradient and the Hessian matrix for the following functions at the specified points. (a) f (x, y, z) = x3 y 2 z at (1, 1, 1). (b) v = r cos(s + 2t) at (1, 0, π2 ). (c) z = 4x3 − xy 2 at (−1, 1).